Celebrate "Solar Max: Storm Warning"
On March 22, 2013, NASA's Sun Earth Days team is joining forces with NASA EDGE to explore the violent nature of our Sun at the peak of solar activity and share discoveries from NASA's heliophysics and planetary missions during this exciting period. NASA EDGE will bring you a LIVE webcast form Wallops Flight Facility (WFF). Download these great Sun-Earth Connection mobile apps from your app store today. This Flash-based viewer allows you to view near real-time NASA satellite images of the Sun and the Earth. 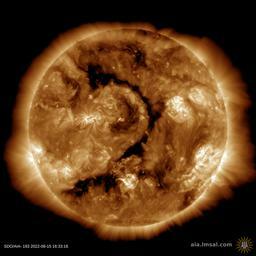 By following the basic steps in the Instructional Guide your class will soon be on its way to tracking a solar storm. The Sun-Earth Days team will keep you updated and informed with the latest news and events.